Living Life Beyond Pain - September is National Pain Awareness Month! 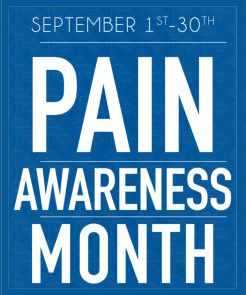 Living Life Beyond Pain – September is National Pain Awareness Month, dedicated to raising awareness about the prevalence of pain and the treatment options available. Many of us see clients with chronic pain struggling to find appropriate resources that may help them regain their quality of life. Chronic pain is defined as prolonged physical pain that lasts for longer than the natural healing process should allow. While it might stem from injuries, inflammation or neuralgias/neuropathies, some people suffer in the absence of any of these conditions. Chronic pain can debilitate one’s ability to move with ease or hinder normal functioning: the search for relief can lead to pain medication addictions, compounding the problem. More people in the United States suffer from chronic pain than from cancer, heart disease and diabetes combined. As grim as statistics on the opioid epidemic are, the attention shines a spotlight on the difficulties with treating pain that is debilitating and long-term. We as therapists have an opportunity to bring our patients tools and techniques that serve as an alternative to dependency on addictive medications. We’ve learned that all pain is real but in the case of chronic pain, the causes can be extremely complex. By offering more comprehensive solutions to our clients, we can provide expertise in teaching the ability to cope with the thoughts, feelings and behaviors that accompany chronic pain. Innovative techniques may help even those with severe long-term symptoms learn strategies for finding relief and regaining their lives. Western medicine is finally acknowledging the balancing act required between managing pain and ensuring that patients don’t get caught in the cycle of dependency on opioid painkillers. Studies have shown that chronic pain might not only be caused by physical injury but also by stress and emotional issues, in particular, people who have experienced trauma such as Post Traumatic Stress Disorder (PTSD). Chronic pain is also often accompanied by feelings of hopelessness, depression and anxiety. Techniques such as breathing methods, Somatic Experiencing™, self-hypnosis, Energy Psychology, mindfulness and other research-validated approaches have provided significant results with every kind of pain. You can help individuals along the entire spectrum of pain learn to create a life beyond suffering. Establishing a foundation based on resilience and strength, we can gradually teach strategies that build confidence and extended comfort, helping clients master and integrate skills that bring reliable results. In Part 2 of this post, I’ll delve more deeply into various techniques to enhance your skills in helping your clients live life beyond pain. Learn these innovative techniques that allow your clients with chronic pain to cope and re-engage.